The Scottish singer's hits included I Won't Let You Down and I Should Have Known Better. 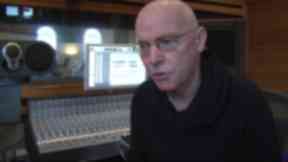 Singer-songwriter Jim Diamond has died at the age of 64, his family have said. The Scottish singer, whose hits included I Won't Let You Down, I Should Have Known Better and Hi Ho Silver passed away at his home in London. Born in Glasgow's East End, he was heavily influenced by the voices of Ray Charles and Otis Redding and joined his first band at the age of 14. He later moved to London, where he formed the band Bandit and went on to sign to Clive Davis' Arista Records. A family statement posted on his Facebook page said: "We are very sad to say that Jim passed away on Thursday, unexpectedly, but peacefully in his sleep. "It was always such a pleasure to him that his voice touched so many people and brought them so much happiness. "He absolutely loved reading all your messages and to hear how his music had touched you all. "Put on your favourite song today and have a think about him, as as well as being an incredible singer, he was an incredible man and we feel so lucky to have had him in our lives." A family spokesman told the BBC: "He was a devoted family man who loved his wife Chrissy and his children Sarah and Lawrence, and the music that he continued to make. "He dedicated a lot of time over recent years to the Cash for Kids charity appeal in Scotland with his friend Sir Tom Hunter and was still active and well respected on the music scene. "He'll be much missed by all who knew him and everyone who loved his music and his unique voice and style." Diamond later went to work in Los Angeles and on his return to London formed the band Ph.D with Tony Hymas and Simon Phillips. The first single taken from Ph.D The Album, I Won't Let You Down went on to sell millions. After Ph.D went their separate ways, the singer signed to A&M Records. The single I Should Have Known Better from his 1984 solo album Double Crossed went straight to No.1 and went on to be nominated for an Ivor Novello award. In 2011 he released soul covers project City Of Soul featuring various Scottish musicians, with all proceeds benefiting children's charity Cash For Kids. In his last post on his Facebook page on September 28 the musician wrote that he had recently lost his mother. He wrote: "Sad to say I lost my mum Sarah last week people say they have the best mum in the world, I did. "If you look up tonight and see a couple dancing on a cloud to the sound of the Count Basie big band that's my mum and dad. As always peace to you all Jx".